A level-converter could be used to “translate” the voltages in each direction. Could we use a schottky-diode (which as I understand blocks current in 1 direction) to block the 5V from the ArduinoRX going into the sensor? But then the 3.3V from the sensor-TX would pass (correct direction ), but the diode will drop the voltage "a bit more"… is this still enough to drive the arduino RX-pin? And it works, why not also use a schottky-diode to also protect the Arduino-TX to sensor-RX connection ( just to be safe, since some people were saying one some Arduino they needed to connect RX-RX and TX-TX to get the communication to work.. ? ). As an alternative to the schottky ( or maybe in addition to it) - Could we simply take 2 voltage dividers (for one for both RX-TX and TX-RX) ? We can use a “resistive voltage divider” to lower the Arduino-TX 5v to 3.3 V - I understand to get from 5V to 3.3V we need “x” and “2 * x” resistors-values, so e.g 1K Ohm and 2K Ohm… but how do I know which values would be appropriate ( I mean, we could also take 10K Ohm and 20K Ohm, would also lead to 5V to 3.3v) but at a different current (Amps)… ? And what about a voltage-divider with a resistor and a capacitor (see https://en.wikipedia.org/wiki/Voltage_divider, low-pass RC filter)? What would be appropriate values for that solution for the resistor and capacitor? Buy some of these, it's a simple hardware solution to your problem then. I know you said you don't want to use a level converter but it's the simplest way around the problem. You stated that you're an electronics beginner AS AM I, which is exactly why when I came up against the same problem i just spent the money. It was only £3.99 for 5 of them and as far as I'm aware you should be able to buy single ones off amazon too, haven't searched but i'd have thought you'd be able to. When the 5V Rx is driven to 5V D1 protects the 3.3V Tx pin. 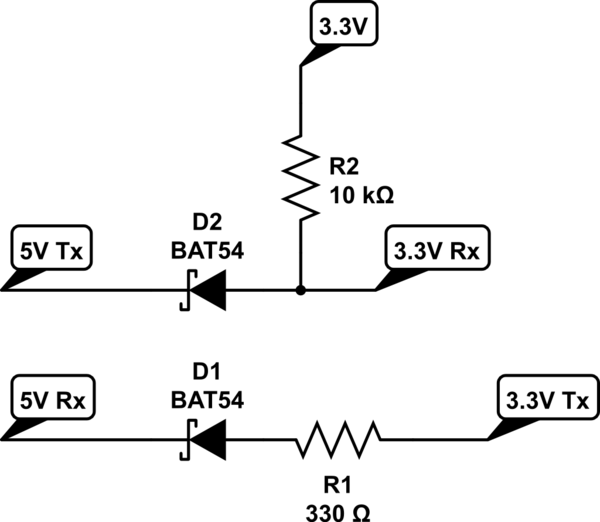 When the 5V Rx is driven to 0V R1 protects the 3.3V Tx pin from excessive current draw. When the 5V Tx is driven to 5V D2 protects the 3.3V Rx pin and R2 pulls the pin to 3.3V. Resistor values are rough guidelines, lower values will put more strain on the parts and increase power draw but will also increase the maximum UART speed that will work reliably. Not the answer you're looking for? Browse other questions tagged voltage-level gps voltage-protection convert or ask your own question. How to use voltage divider between ESP8266 (3.3v) and IR proximity sensor (5V)? System voltages: Can I use a 5V touchscreen shield on a 3.3V arduino?